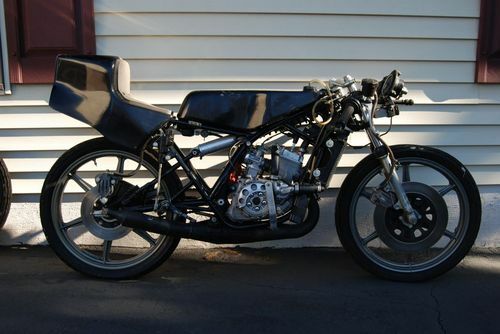 What better way to sell 2-stroke racing motorcycles then to make it a 2 for one auction. 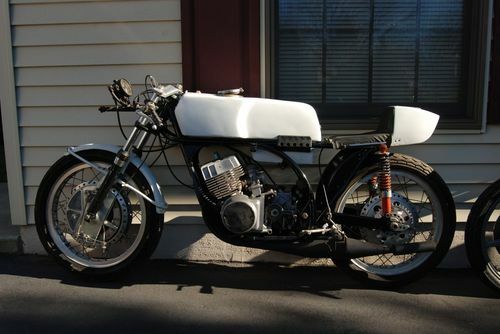 What appears to be up for sale is a 1979 Yamaha TZ125g, and an unknown vintage Yamaha TR2 race bike. One has a beautiful Four Leading Shoe anchor of a front brake, and the second a huge pizza pan of a front brake. 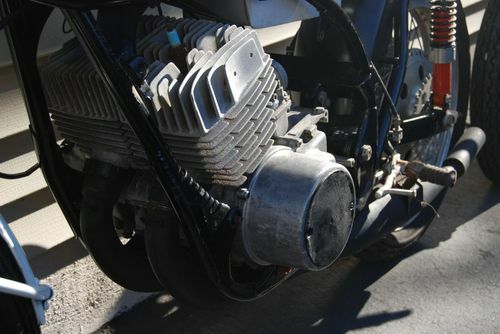 Because a smokin’ 2 stroke can really make a bike go, you have to have the right tool up front to stop it. If you like what you see you want to act quickly as the bidding will end soon. 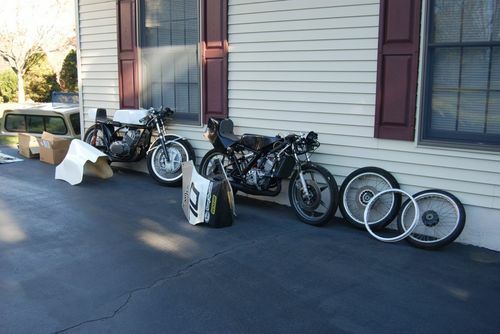 Here are two vintage Yamaha two stroke racers from a retired racer’s garage. These have been sitting since around 1982. The TZ125G is supposedly a 1979 model. I was told that the engine was rebuilt and has approx only 3 miles on it when it was parked. 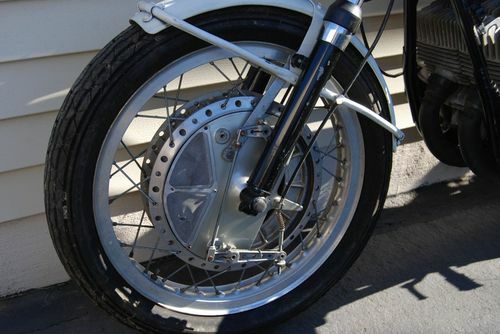 It comes with the installed magnesium wheels and the original wire spoke rims. The TR2 has unknown health but turns over and appears to be 95% there. Both were drained of gas when put in storage so you should not have to deal with any gum. All I can say is study the pictures. Both come with bunch of parts and I’m not sure how they divide up but I think the 125 has the most spare parts. There are NOS brake cylinders, CDI, stators, clutch parts, heads/cylinders/pistons/rings/gaskets/seals/washers, chain rings, jetting kit, carb, and so much more including plugs and so on. Upper fairings are gone but lowers, including a new lower and windshield that was bought back in the 80s.I think they go to the 125 – not 350 as he pictures might suggest. 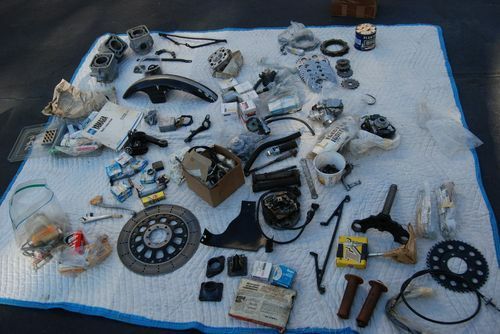 I took TONS of pictures of the bikes and parts stash. you have to go to photo bucket to see them which I insist you do prior to bidding. These are very rare bikes and don’t come up often for sale. They are not that big of a project to get to racing condition or you can choose to restore them to factory spec for display. I make no guarantee about these bikes and I’m not well versed on two strokes. Bid accordingly. The TZ125G, a bike that has been highlighted on out sister site RSBFS, is the smallest of the TZ extensive line offered up by Yamaha. The TZ250, TZ350, TZ500 and the big boy TZ750 were offered up as a very successful weapon for racing on the road or oval dirt track. The 1979 TZ125G is a water cooled, mono shock little racer that had all the racing development of Yamaha and their Grand Prix success boiled down into a little 125cc smoker. 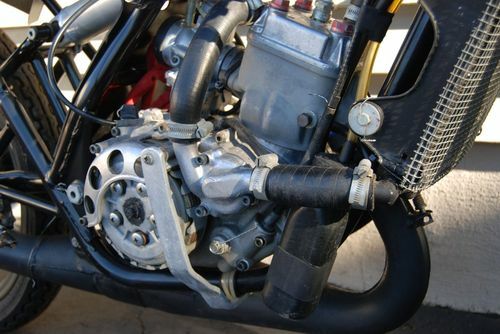 It may not be the TZ750 that scared Kenny Roberts around the Dirt Tracks. But take it out to your local vintage race, and I am sure it will elevate your heart rate to health levels. From the multiple corrections to the listing, there are either lots of questions being sent to the seller, or the seller is learning about the bikes as the auction goes along. THE MAGNESIUM WHEELS ARE MARKED “MADE IN ITALY” AND “FOR COMPETITION ONLY” – I CAN’T SEE ANY MAKERS MARKS. AND APPEARS TO HAVE NEVER BEEN LACED – NOT SURE. 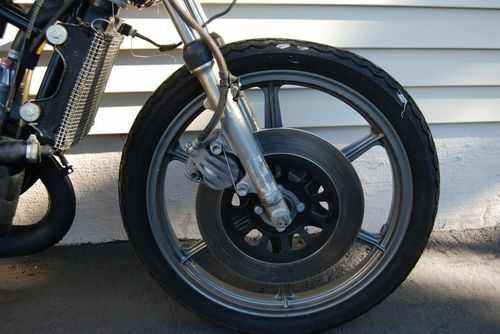 THE RIMS ARE IN EXCELLENT CONDITION AND COME WITH NOS SPOKES. The Yamaha TR2 was first put on the track by Yamaha in 1969 as its 350cc offering to Grand Prix racing. It followed the Yamaha racing TD2, and was the first to have a horizontally split case. With around 55bhp offered up in 1969, and a frame that takes hints from the excellent handling Norton Featherbed frame, it was a winning combination. Because it was offered to privateers, with parts available over the counter at your local Yamaha dealer, you can imagine it found its way into the average Joe’s garage. And that appears to be were both these bikes are coming from. A “G” model should be a 1980, following the standard year designations by Yamaha of the day.